Saskia Olde Wolbers’ videos are fantastical stories matched by equally fantastical landscapes that have the appearance of being computer generated but that actually are meticulously constructed and filmed miniature sets. The viewer continuously floats through these images being carried, as well, by the lull and hypnotic lure of the narrative voiceover. But Olde Wolbers’ videos are just as much about the fabrication of fictions. 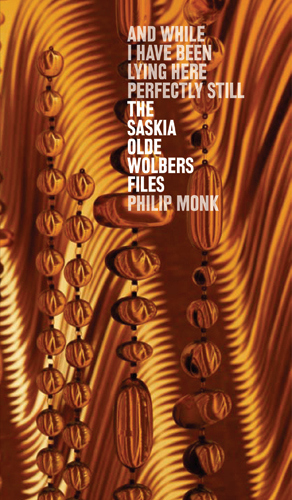 Similarly, And while I have been lying here perfectly still: The Saskia Olde Wolbers Files is a fiction about these fabrications. In this book, Olde Wolbers’ artworks are treated at an interpretative remove through the genre of psychological case studies. But as if written by Edgar Allan Poe, these are case studies where the doctor/ author, an expert in pseudologia fantastica, is himself a pathological liar. The book as a whole is an experimental genre, talking about artwork at a remove through genres of fiction. That is, the fictional construction of the book is one more level of commentary on Olde Wolbers’ own fabrication of fictions. The format of the book mimics a 1960s paperback pocketbook series, in particular the Grove Press Black Cat Series, which published Beckett, Burroughs, Robbe-Grillet, etc., as well as books on sado-masochism and psychoanalysis, etc. Essay by Philip Monk, designed by Bryan Gee.